Kill Process was like 5 books rolled into one. It was one of those books that I had to take in bite-sized chunks because I didn’t want it to end. I found this book because of Hertling’s Avogadro Corp books. I must have bought it months ago because when I saw the second book in this series while prepping my weekly New and Notable posts I was surprised and thrilled to see it in my library. Kill Process tells the story of Angie, a 45-year-old hacker/programmer with lots of problems. She works for Tomo (basically a fictional Facebook) by day and at night she kills off domestic abusers in mysterious ways. That’s just the first part of the book (and what could have been its own book). She’s introduced to a new product that Tomo wants to introduce and decides that she can no longer work for such a disingenuous company and strikes it off on her own to try and compete with the tech giant. What follows would be a spoiler but is full of a wild ride of a story from beginning to end. 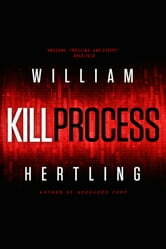 Kill Process is Hertlings best book I’ve read yet. He fills the pages with perfect examples of tech, white and black hat hacking, real SQL database queries, and lots of other techno-jargon that would give people who work in the industry that “feel good” feeling knowing how much Hertling knows and is able to shove into the book. Think The Martian for space/science but for computers and tech. It definitely had a Mr. Robot feel (without the distinctive split personalities) especially when it came to the hacks that Angie described. It also had a bit of a Fight Club feel (also without the same distinctive split personalities) but the “take down the man” feel. It throws in a lot of other things from a lot of other sources but the biggest thing that it felt was real. Sure, Tomo is not Facebook, but it is. They know everything about us, the way that Hertling describes the way that they keep users, not because they want to stay, but because it’s where all their friends just hit a little too close to home. Throw in the recent data breaches and other similarly pitched products by Facebook and it’s a terrifyingly real depiction of where we could be right now without even knowing it. I work in the tech industry (specifically in and around online advertising) and the scene where Angie talked about using data to figure out that moving an ad 3 degrees in Cincinnati (I think that was where she said) caused a higher click-through rate hit a little too close to home for me (but also made me realize just how good Hertling’s research and knowledge of the industry is. Another thing that I think Hertling hit on the head with Kill Process was the psychological feelings, reactions, and inner thoughts that Angie had after enduring what she endured with her husband. Even the conversations with her therapist were definitely taken from real therapy sessions and ways that people can calm anxiety among other issues. The repeated scenes of flashbacks, reactions, and irrational thoughts that Angie describes feeling were absolutely perfect. So perfect that I wonder if they would cause a real trigger for others who have been abused (physically or emotionally). My wife was never in anything that rough, but there are still things that she does (where she sits in a restaurant is a good example) that Hertling perfected with Angie. I know that the second book in this series was just released, but I need to take a mental break for a few days. I will hopefully read it before the end of 2018 (but no promises). Hertling is on the top of his game interweaving the Avagadro world with the Tomo/Tapestry world mentioning Avagadro numerous times and spurring that little memory bank from reading some of the Avogadro Corp books. A fantastic technothriller that will stick with me for a long time. 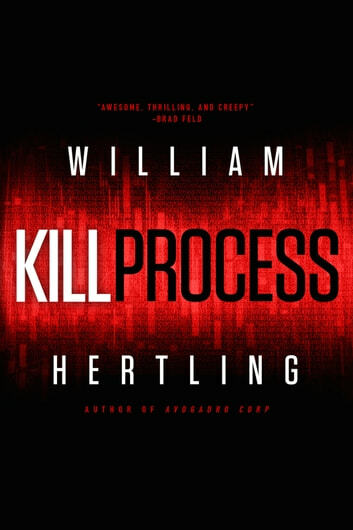 Hertling’s Kill Process is one of the best books in the genre I’ve read in a long time. VERY Scary - to think that this really happens. Liked the story minus the really tech-y bits. Very well written and enjoyable. Thought provoking about our digital signature and who is watching us. Crime, computers and a good read. So why cant I log on to this company? Sounds like a fine idea. Didn't think this was my kind of book but really enjoyed it.